Congratulations to the Perlee Family on the sale of Johannesburg! for trusting us to guide you through the sale of your special horse! 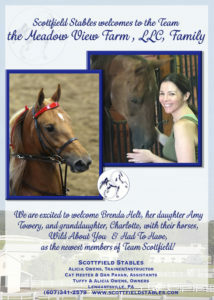 We are excited to welcome Brenda Helt, her daughter Amy Towery, and granddaughter, Charlotte, with their horses, Wild About You & Had To Have, as the newest members of Team Scottfield! From Allentown, New Jersey, the grand matriarch of this family of horsewomen, Brenda Helt, has been in Saddlebreds her entire life. In addition to showing and competing herself everywhere from Madison Square Garden to Louisville, Brenda maintains a broodmare band in Kentucky with long time friend and business partner, Joan Lurie. Brenda’s daughter, Amy, has also been a lifelong rider, but is relatively new to the Saddlebreds, and is teamed with the fabulous hunter, Wild About You. Granddaughter Charlotte is the definition of a horse crazy young lady! 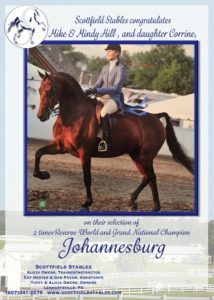 At 11, Charlotte can rattle off any pedigree, most show records and will happily report any number of World Champion horses to be her very favorite! We are enthusiastic to see where Charlotte’s passion and talent takes her in 2017! A product of Brenda’s wonderful breeding program, the fresh faced mare Had To Have also made the move to Scottfield. This season looks to be an exciting one for all of us! Welcome to the Team, ladies!